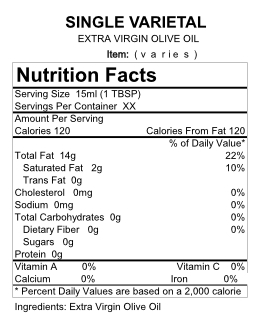 Chilean Arbequina EVOO – Mild – Olive That! This Arbequina oil was made from a blend of early harvested fruit and some ripe fruit, so it reflects the characteristics of both. It is quite bitter and pungent and very fruity with a dominant aroma and taste of ripe apple. It also has some characteristics of green apple, artichoke, nettle, and black pepper, so a blend of many complex flavors.